A community solar garden can be anywhere from 10 kilowatts to 2 megawatts, or from the size of a large roof to several acres of ground-mounted panels. A solar host must sign a 20-year lease contract. After the term of the lease has expired, the lease can be extended, and the array can be upgraded, replaced, or decommissioned. 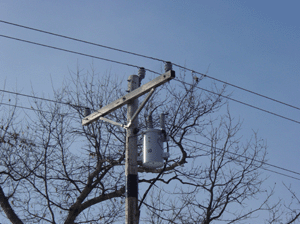 Single-phase power line - too small for a solar garden. We are evaluating a model in which a host could receive a subscription to the solar garden in return for leasing. Alternately, an annual donation to charity might be made in the host’s name. The level of compensation is modest, similar to dryland wheat farming or dryland grazing. In urban areas where land is prohibitively expensive, it will be more cost-effective to use land that cannot be used for other purposes, or that has a second use other than solar. A solar lease can provide an alternate income stream to a landowner facing oil or gas drilling. In areas where land is cheap and there is lots of sunshine, it might make sense for a community group or subscriber organization to purchase land for the purpose of becoming a solar host. In the so-called “Minnesota Flip”, the ownership of panels can be transferred to local control after 6 or more years have passed. 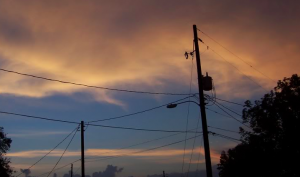 Three-phase power lines - just right for solar gardens! Gary Nystedt, solar gardener for Ellensburg Washington, suggests a town might host a solar array on its water treatment plant or airport. The Solar Gardens Institute has two water treatment plant sites under contract in Colorado. Farmers with center pivot irrigation circles can host panels on the corners of their property. Other potential host sites include industrial zoned property, warehouses, gravel pits, landfills or mine sites, and parking lots. Crops, grazing, or landscaping might occur beneath the panels. We must be able to connect your solar garden to the grid – this requires access to three-phase power lines or a substation. Existing transformers might provide a cost-effective point of connection to the utility grid. 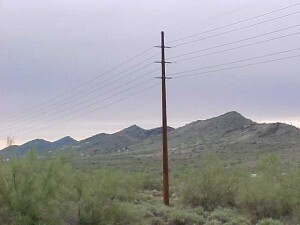 We cannot connect to transmission lines – that would be like trying to connect a garden hose to a fire hydrant! Each solar garden must have at least ten subscribers, one of which can be the host. Transmission line - too big for solar gardens! Corporation called a “subscriber organization” to manage the solar array. All costs of installing, insuring, and maintaining the solar array, as well as its eventual decommissioning, are the responsibility of the array owner rather than the host. The subscriber organization maintains a fund in order to meet its responsibilities. Solar hosts can help provide power for their communities, while receiving clean, renewable power. 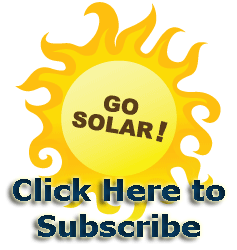 Become a solar host! What Power Company Do you use?